It is that time of year! The season of gift-giving, generosity, and gratitude are upon us again, and it is never too early to get a jump on the holiday gift list. If you have been contemplating on what to give your loved ones this winter, we have a few suggestions that just might set your mind at ease. Whether you are shopping for a dedicated miniature garden enthusiast or someone who has never heard of fairy gardening, these tips will cover everyone on your list. In the cold, dreary, and blustery weeks of the year, what could be a better sight to see than a fresh, thriving miniature plant? If someone on your list is moving to college or living in a small apartment, you might consider getting them a bonsai tree. These small, ornamental plants may be short in stature, but they have huge personalities and pack in lots of “Wow!” factor. Start with an indoor bonsai planter in the giftee’s favorite color. The containers come in a variety of shapes. Then you have your pick of trees: those that flower, those that do not, and even those that produce edible fruit! 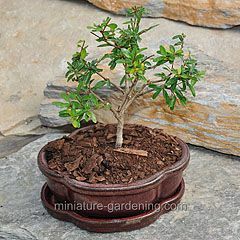 With pruning and care, these miniature trees will thrive in a small (or large) space. Do you have friends and family who are already dedicated to their miniature garden projects? Have no fear. You can still find a gift that will delight them. Two thousand and nineteen might be the year to invest in a unique miniature house. With so many styles to choose from, you are sure to find one they do not yet have. While fairies live in tree stumps and flower meadows, they also love to take up residence in a small gourd, camper trailer, barn, shell - the options are nearly endless! Your loved one will be impressed and excited by their new extra-special fairy house. It might even inspire them to create an entirely new section in their miniscape, or a new container garden at home. No matter how much of a skilled gardener you may be, there are always those friends, family members, and colleagues who would not go near a plant with a ten-foot pole. If this has you scratching your head during the holidays, try reaching for something garden-adjacent that is still their speed. Terrarium planters are quickly gaining popularity. Some sit on a table, while others can be hung from the ceiling with care. These fashionable items are easily fillable with succulents, air plants, and other hearty, low-maintenance plants. Do you ever wonder why an air plant does not need soil? Just a few sprays of water are all it takes. If you are hoping to entice your friend to join your fairy gardening ways, consider a kit. These have everything you need for a stand-alone scene, such as an afternoon tea or rustic retreat. With a kit and planter in hand, all your friend needs to do is add some soil, pebbles, or another landscaping material. Nothing could be easier. If you have a batch of friends and family, who share your miniature gardening passions—lucky you! Unfortunately, you might feel unlucky when it comes to the holidays, and you are trying to shop for those who have already meticulously planned and planted their gardens. This problem can quickly be solved with a gift certificate. A certificate to their favorite garden shop, or even a store that is new to them, can be like giving the gift of shopping. As miniature gardeners, we know the shopping part can be the most fun of all! 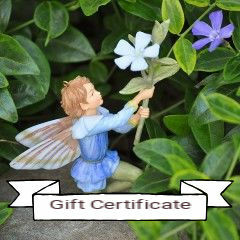 Pair a gift certificate with the promise of an afternoon of coffee and fairy garden talk, and your friend will have a great day. If you want to give the certificate alongside a physical gift, search out a holiday-themed miniature accessory. 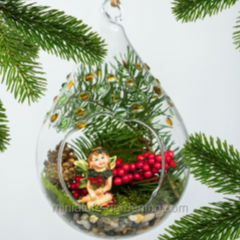 A Santa Hat House or Fairy Ginger with a Sleigh may be pieces on their Wishlist, and these seasonal fairy garden accessories will add extra holiday cheer to their garden. When you have finally crossed everyone off your gift-giving list...celebrate! You have survived another year of the holidays. The best way to pat you on the back, of course, is to do a little shopping for your miniature garden. 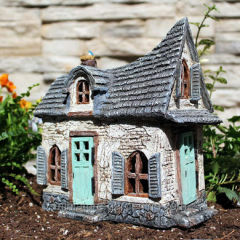 Is there a new fairy house in your future or the beginnings of a summertime garden? Now might be the perfect time to add a new fairy or miniature accessory to your collection. This blog post was published on 11/21/2018 18:34:24. There are currently no approved comments for this blog post. Note: Your comment will not appear until it has been approved. Your comment could not be saved: comment needs to be at least 50 characters long. Please try again or contact us.